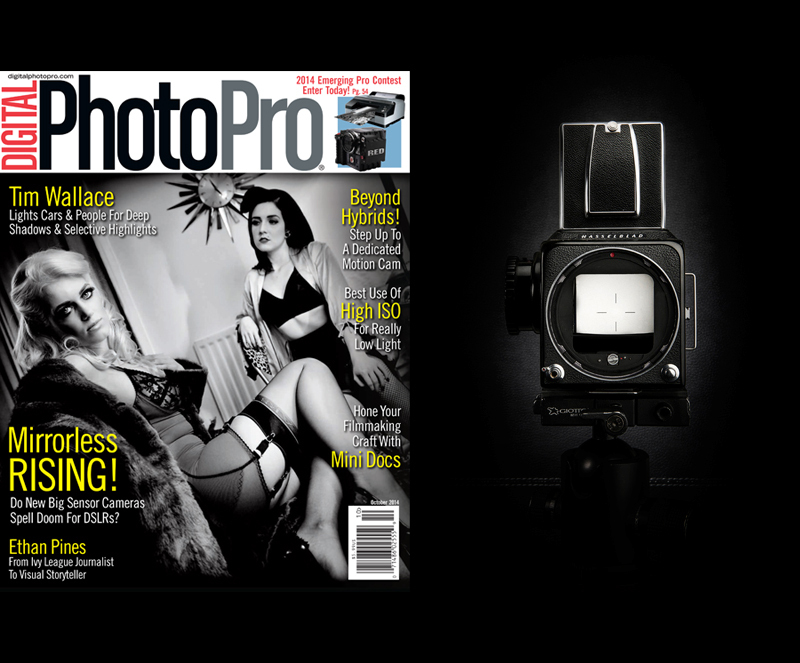 William Sawalich spoke with UK based commercial photographer Tim Wallace for a major 8 page Pro feature that is out now in the Sept / Oct issue of Digital Photo Pro Magazine in the US, Tims work is also featured and makes up the magazines front cover for this edition. 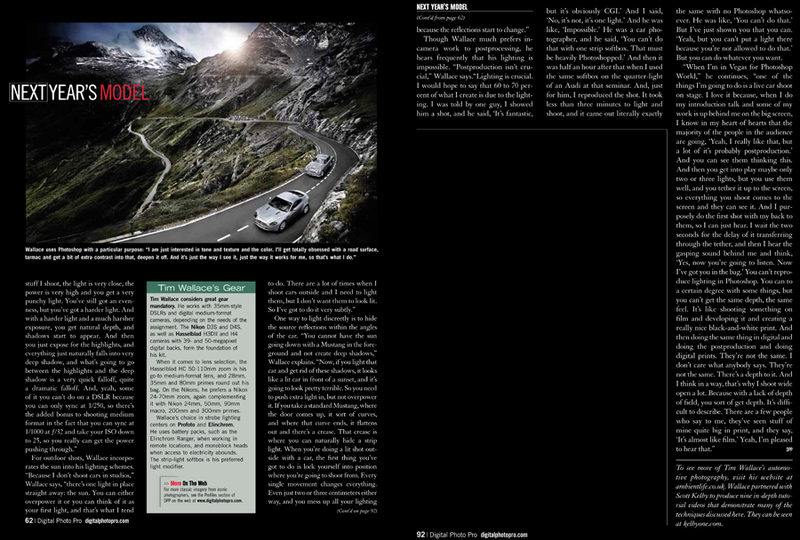 Tim Wallace's intense car photography is more about light than digital processing and, as he points out, lighting cars isn't easy. "If you ever try to light a car, you'll realize how difficult it is. Because they are actually just multi-angled reflective surfaces. The amount of times that I've thought, 'My god, why didn't I just do food? or people? or something that doesn't reflect? I hate this!' But it's just the mere fact that it is quite difficult to do well, that it's probably a very good thing for me, because it means there aren't a million people doing the same thing as I do." 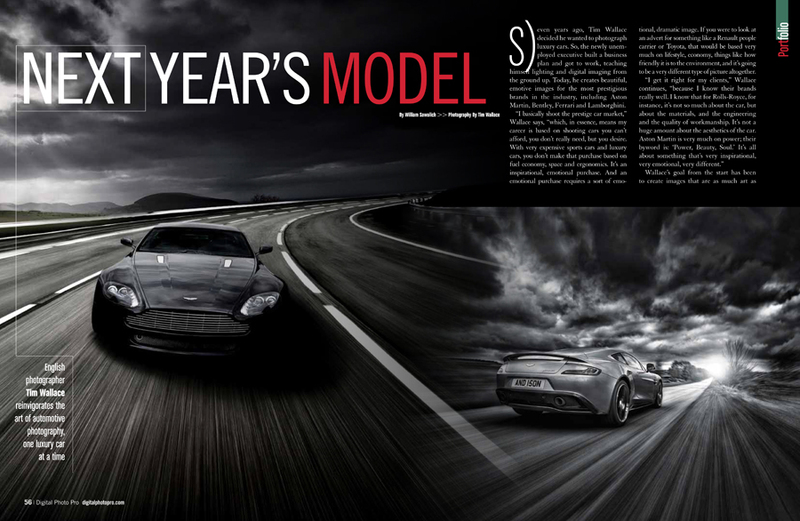 Seven years ago, Tim Wallace decided he wanted to photograph luxury cars. So, the newly unemployed executive built a business plan and got to work, teaching himself lighting and digital imaging from the ground up. 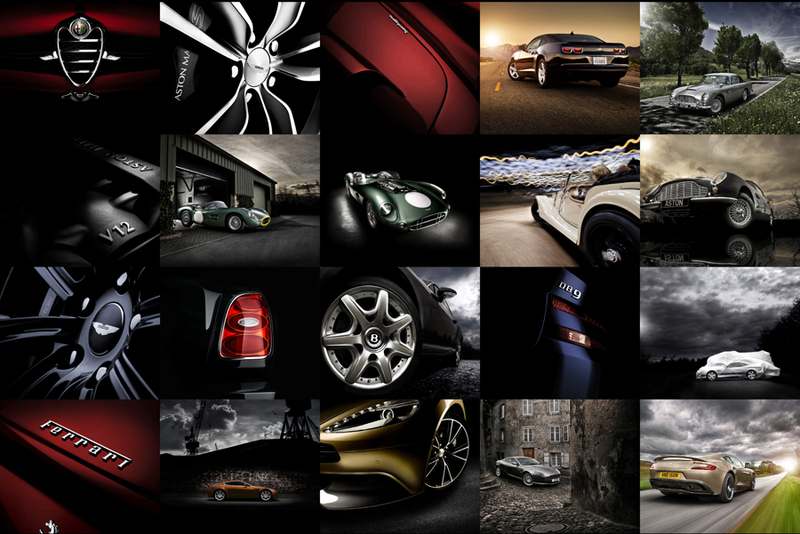 Today, he creates beautiful, emotive images for the most prestigious brands in the industry, including Aston Martin, Bentley, Ferrari and Lamborghini. "I basically shoot the prestige car market," Wallace says, "which, in essence, means my career is based on shooting cars you can't afford, you don't really need, but you desire. With very expensive sports cars and luxury cars, you don't make that purchase based on fuel economy, space and ergonomics. It's an inspirational, emotional purchase. And an emotional purchase requires a sort of emotional, dramatic image. If you were to look at an advert for something like a Renault people carrier or Toyota, that would be based very much on lifestyle, economy, things like how friendly it is to the environment, and it's going to be a very different type of picture altogether. "I get it right for my clients," Wallace continues, "because I know their brands really well. I know that for Rolls-Royce, for instance, it's not so much about the car, but about the materials, and the engineering and the quality of workmanship. It's not a huge amount about the aesthetics of the car. Aston Martin is very much on power; their byword is: 'Power, Beauty, Soul.' It's all about something that's very inspirational, very emotional, very different." Wallace's goal from the start has been to create images that are as much art as advertising. That, plus his clients' need for inspirational imagery, has shaped his moody visual style. "Photographers should develop their own unique style," Wallace says. "It's absolutely crucial. My stuff is quite harsh, not in a tonality or anything like that, but I do like deep shadows; I like a lot of black space. I give my subjects a lot of space. I did a thing today, actually, the back of an Aston Martin DBS. You've got the DBS badge and the quarter light, and it's a strip of light running down the paintwork, and then it illuminates the massive exhaust tailpipe at the bottom. And yet I've allowed about five or six feet on each side of it in total darkness. I've allowed it that space, and I'm hoping they don't crop it too much." The seeds were sown for Wallace's aesthetic during childhood, when he printed photographs for his grandfather. He wasn't particularly interested in taking pictures, but he enjoyed printing, and he was very good at it. This led a teenage Wallace to land a darkroom job for a London newspaper, which eventually led to photography. It's the printing, though, that's still evident in his shadow-rich work today. "Obviously, a lot of the stuff I did was black-and-white," he says, "and even now, if I look at an image I'm going to shoot, I pretty much know in my head what I'm going to do before I do it. I reverse-engineer it. And I still think of it in black-and-white, grade 1, 2, 3 or 4, which is very unusual. I think it comes from printing. If you talk to anyone that has printed at a reasonable level, they get very obsessive about the blacks, 'That's not deep enough,' or 'It's not warm enough.' And I just think that less is more. When you're doing cars, you don't need everything brightly lit. It needs to be opulent, it needs to be slightly mysterious. And you don't need to see the entire car, you don't need to see the entire interior. "Say you're doing the interior of a Corvette," Wallace continues. "It's a sports car, it's a luxury car and it's a cockpit. It wants to be a dark, opulent, luxurious place with lots of toys. I don't like to overlight things. When I'm doing the overall statics for the cars, I know a lot of guys will stick them in a studio and just stick them in front of an infinity cove. In the last 12 months, I've shot once in a studio. I just don't think cars belong in studios. I'd rather shoot them out in the environment where they belong." Shooting on location, both indoors and out, Wallace attends to his lighting like an old-school studio pro. "I have done stuff in a factory, where cars are literally getting built around me," he says, "and I'm in a clear bit of floor in the middle shooting a wheel or something. And people go, 'Wow, did you take it off and did you have it in a studio?' And I'm like, no, if I actually did a behind-the-scenes shot, you wouldn't believe where I did it. It's light. Light is an amazing thing. But you've got to understand what you can do with it. I basically taught myself how to light cars, and I'm still learning all the time." To create his signature deep shadows with selective highlights, Wallace uses strip lights positioned close to the car. "A softbox is very soft light, and it spreads," Wallace says. "Well, yeah, because inherently that's what softboxes do. But what not many people realize is, you can change the properties of the light very easily by doing certain things. Everyone gets obsessed with the position of a light, but there are two other dimensions to light they don't often think about. One is the power output. They think, 'Well, if I just get the right exposure, then that's the correct power output,' which is fine, but obviously, there's a sliding scale. You know, you can put that light on very low power and turn it into a wider aperture, and you're still going to get the same exposure, but you're going to get a different dynamic. And the other is the proximity of the light, how close the light is to the subject. For a lot of stuff I shoot, the light is very close, the power is very high and you get a very punchy light. You've still got an evenness, but you've got a harder light. And with a harder light and a much harsher exposure, you get natural depth, and shadows start to appear. And then you just expose for the highlights, and everything just naturally falls into very deep shadow, and what's going to go between the highlights and the deep shadow is a very quick falloff, quite a dramatic falloff. And, yeah, some of it you can't do on a DSLR because you can only sync at 1/250, so there's the added bonus to shooting medium format in the fact that you can sync at 1/1000 at ƒ/32 and take your ISO down to 25, so you really can get the power pushing through." 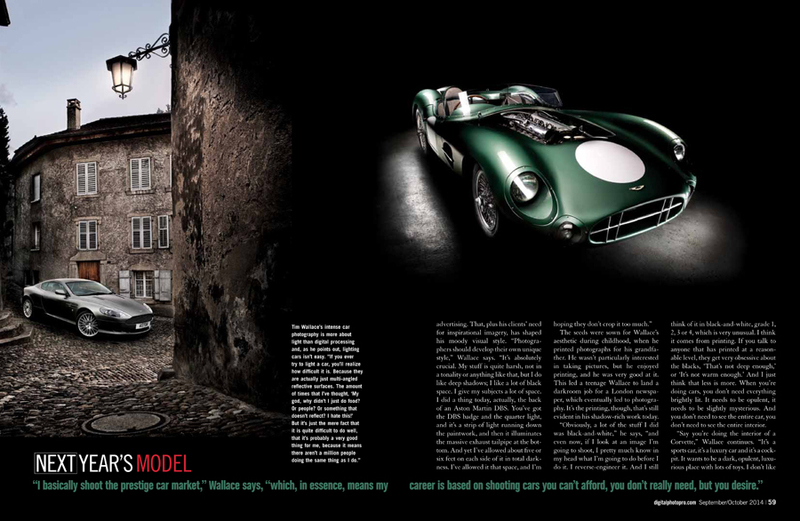 Wallace shoots exotic cars like the Aston Martins shown in this article, as well as collector cars like the classic American models here. He specialized from a business perspective. "There were a lot of guys shooting cars, and it was very much magazine-cover type stuff, but there was nobody really doing it very high-end, commercially. When I first started, people said, 'You won't succeed. You'll fail within a year.' They also said, 'You're too old,' which was moderately amusing because I wasn't even 40 then, and I think age has no bearing on anything. And thirdly, interestingly, they said, 'You won't succeed commercially because your stuff is too much like art, it's too artistic.'" Wallace has proved them all wrong. For outdoor shots, Wallace incorporates the sun into his lighting schemes. "Because I don't shoot cars in studios," Wallace says, "there's one light in place straight away: the sun. You can either overpower it or you can think of it as your first light, and that's what I tend to do. There are a lot of times when I shoot cars outside and I need to light them, but I don't want them to look lit. So I've got to do it very subtly." One way to light discreetly is to hide the source reflections within the angles of the car. "You cannot have the sun going down with a Mustang in the foreground and not create deep shadows," Wallace explains. "Now, if you light that car and get rid of these shadows, it looks like a lit car in front of a sunset, and it's going to look pretty terrible. So you need to push extra light in, but not overpower it. If you take a standard Mustang, where the door comes up, it sort of curves, and where that curve ends, it flattens out and there's a crease. That crease is where you can naturally hide a strip light. When you're doing a lit shot outside with a car, the first thing you've got to do is lock yourself into position where you're going to shoot from. Every single movement changes everything. Even just two or three centimeters either way, and you mess up all your lighting because the reflections start to change." Though Wallace much prefers in-camera work to postprocessing, he hears frequently that his lighting is impossible. "Postproduction isn't crucial," Wallace says. "Lighting is crucial. I would hope to say that 60 to 70 percent of what I create is due to the lighting. I was told by one guy, I showed him a shot, and he said, 'It's fantastic, but it's obviously CGI.' And I said, 'No, it's not, it's one light.' And he was like, 'Impossible.' He was a car photographer, and he said, 'You can't do that with one strip softbox. That must be heavily Photoshopped.' And then it was half an hour after that when I used the same softbox on the quarter-light of an Audi at that seminar. And, just for him, I reproduced the shot. It took less than three minutes to light and shoot, and it came out literally exactly the same with no Photoshop whatsoever. He was like, 'You can't do that.' But I've just shown you that you can. 'Yeah, but you can't put a light there because you're not allowed to do that.' But you can do whatever you want. 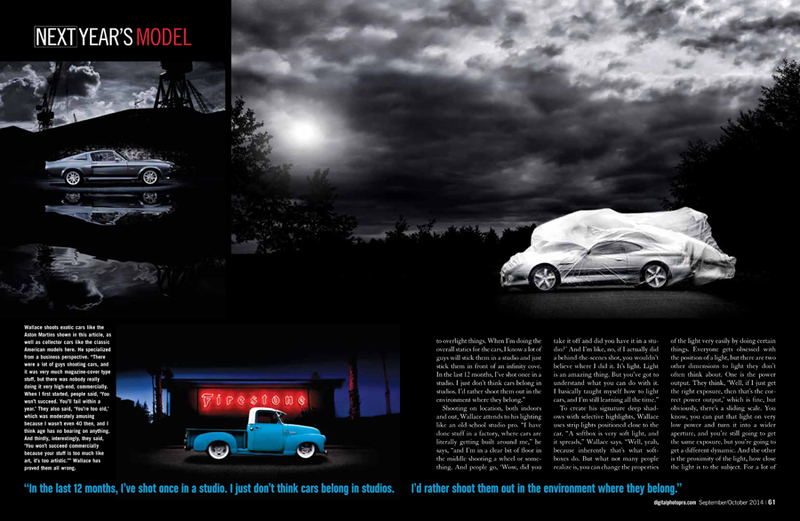 "When I'm in Vegas for Photoshop World," he continues, "one of the things I'm going to do is a live car shoot on stage. I love it because, when I do my introduction talk and some of my work is up behind me on the big screen, I know in my heart of hearts that the majority of the people in the audience are going, 'Yeah, I really like that, but a lot of it's probably postproduction.' And you can see them thinking this. And then you get into play maybe only two or three lights, but you use them well, and you tether it up to the screen, so everything you shoot comes to the screen and they can see it. And I purposely do the first shot with my back to them, so I can just hear. I wait the two seconds for the delay of it transferring through the tether, and then I hear the gasping sound behind me and think, 'Yes, now you're going to listen. Now I've got you in the bag.' You can't reproduce lighting in Photoshop. You can to a certain degree with some things, but you can't get the same depth, the same feel. It's like shooting something on film and developing it and creating a really nice black-and-white print. And then doing the same thing in digital and doing the postproduction and doing digital prints. They're not the same. I don't care what anybody says. They're not the same. There's a depth to it. And I think in a way, that's why I shoot wide open a lot. Because with a lack of depth of field, you sort of get depth. It's difficult to describe. There are a few people who say to me, they've seen stuff of mine quite big in print, and they say, 'It's almost like film.' Yeah, I'm pleased to hear that." Tim Wallace considers great gear mandatory. He works with 35mm-style DSLRs and digital medium-format cameras, depending on the needs of the assignment. The Nikon D3S and D4S, as well as Hasselblad H3DII and H4 cameras with 39- and 50-megapixel digital backs, form the foundation of his kit. it with Nikon 24mm, 50mm, 90mm macro, 200mm and 300mm primes. 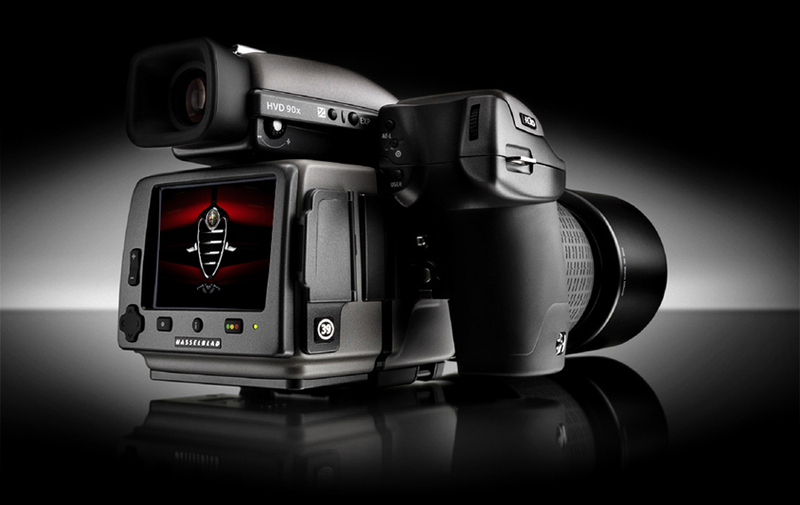 Wallace's choice in strobe lighting centers on Profoto and Elinchrom. He uses battery packs, such as the Elinchrom Ranger, when working in remote locations, and monoblock heads when access to electricity abounds. The strip-light softbox is his preferred light modifier.